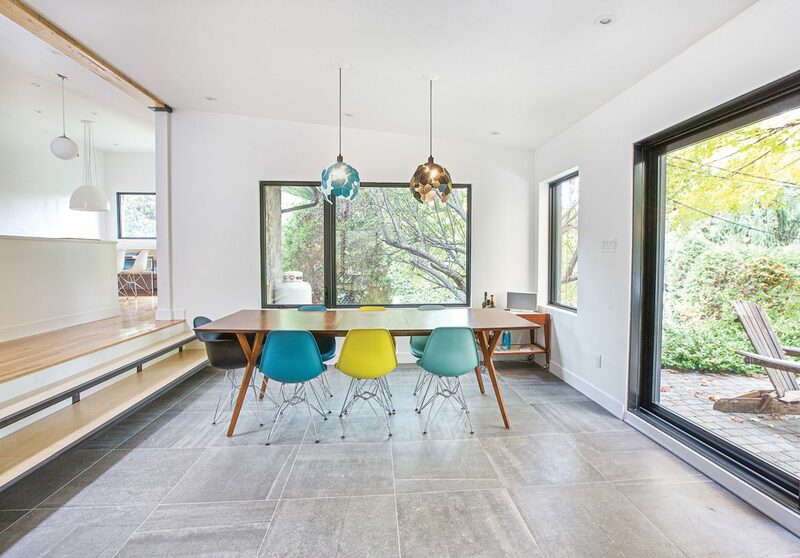 The kitchen gives the homeowners unobstructed views through many windows as they work behind the long island. 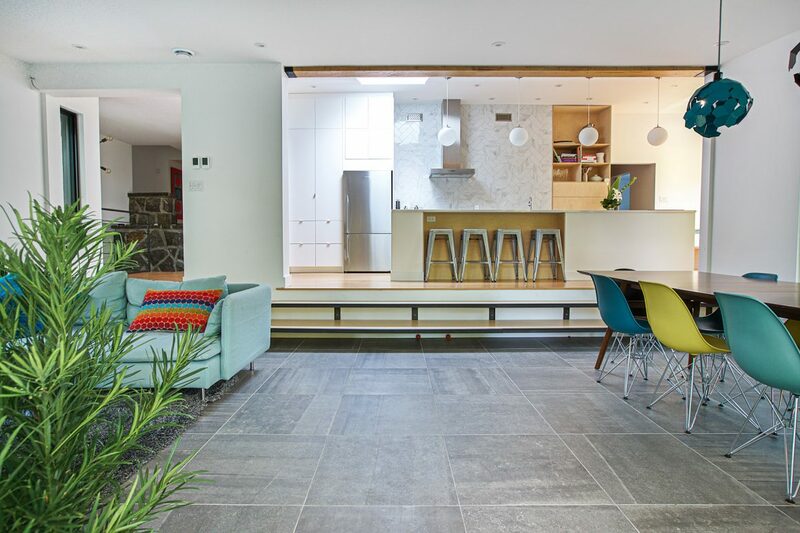 The slight grey in the chevron marble tiles on the backsplash and the silver stools bridge the gap between the ’60s and today’s stainless steel appliances. 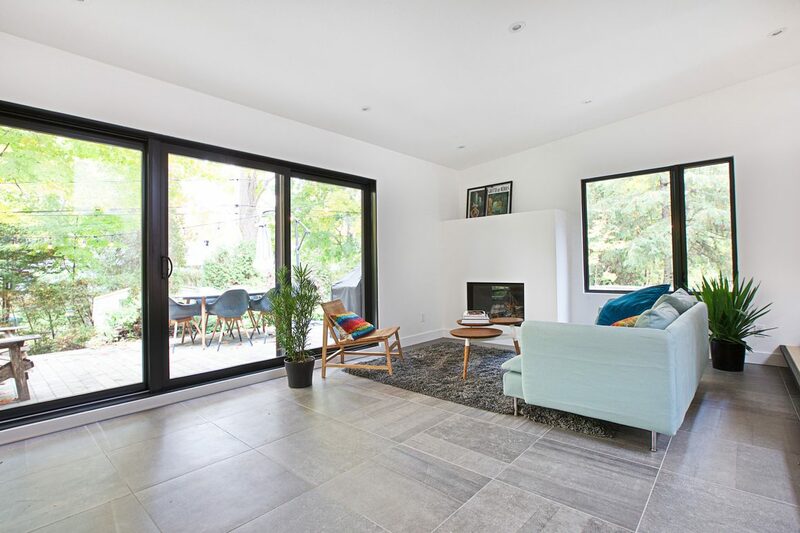 Earthy slate tiles attractively blur the indoor/outdoor living space. 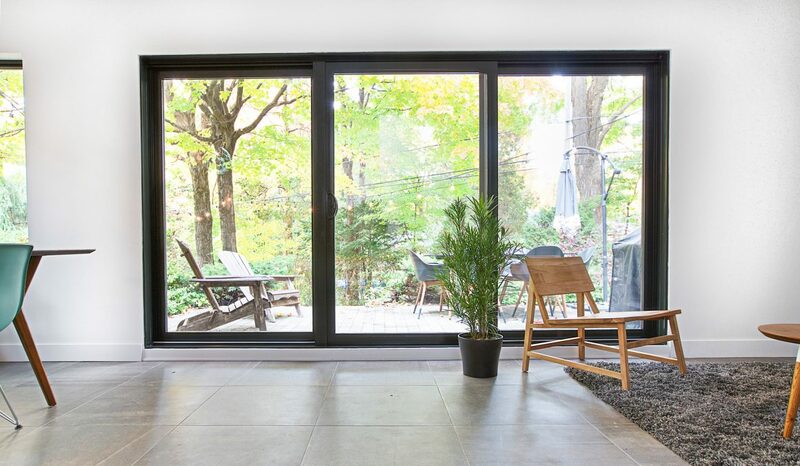 Her husband, Sylvain Martel, along with designer Virginie Lamothe at Bipède Atelier de Design, persuaded her that the Rosemère split-level could be turned into a spacious, bright and open abode that pays homage to 1960s modernity, albeit with a contemporary flow. 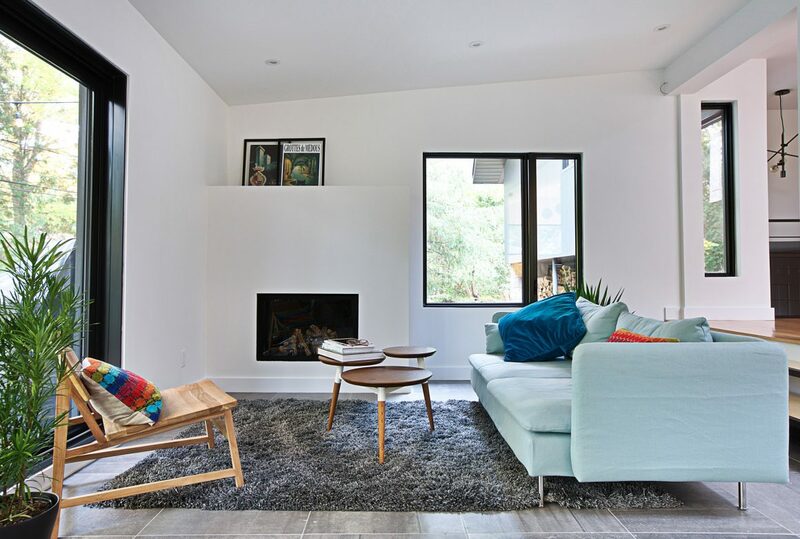 A corner of the minimalist space is cozied with a shag rug and a fireplace that works at the flick of a switch. “They reassured me that a structural engineer could help us to lift a ceiling, move walls and install windows most everywhere to create the space that we sought within the existing footprint,” Stéphanie says. 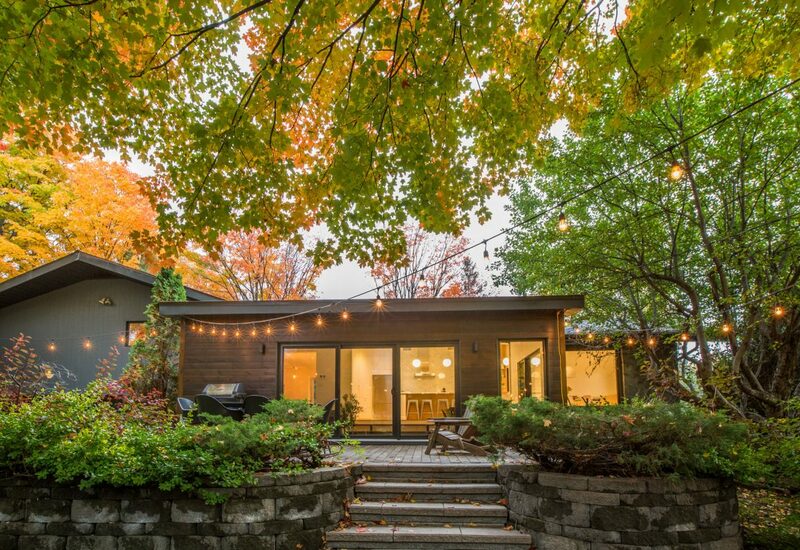 Already charmed by the private treed lot in a pleasant neighbourhood, she agreed to the home purchase and renovations, still holding her breath until she began to see the reconfigured space take shape. Lamothe and her team started by expanding the kitchen and making it feel a lot more open. They replaced a standard eight-foot-high ceiling with a vaulted one by taking advantage of existing attic space. Walls were removed to open up the kitchen. The ceilings were heightened by opening up dormant attic space. Windows dramatically frame the densely treed property. 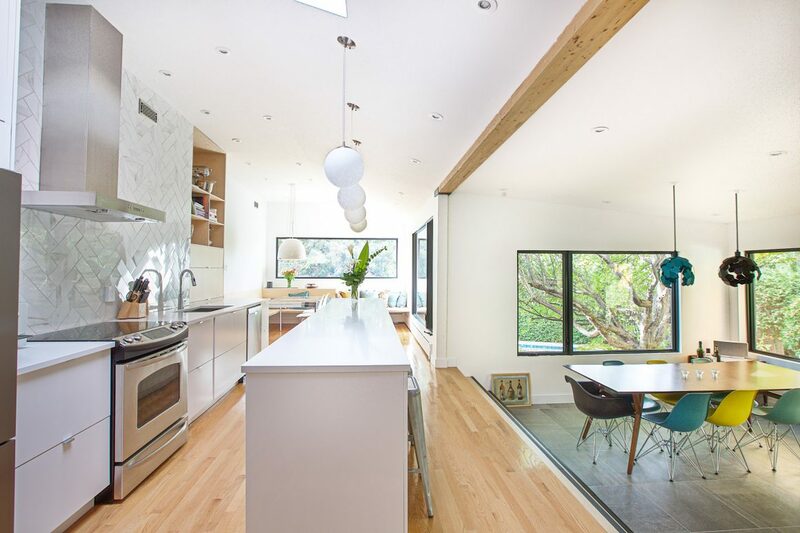 By installing an exposed pine ceiling beam, they were able to remove a wall and open the kitchen to overlook the new dining and living areas. 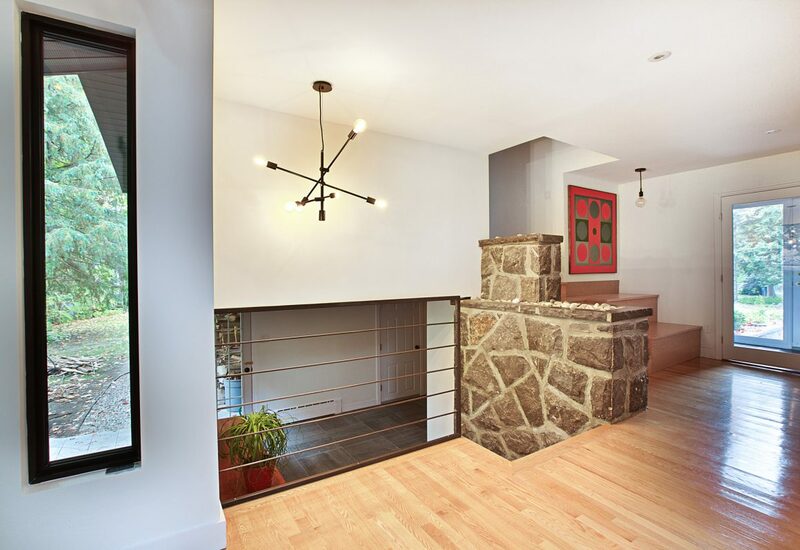 Lamothe’s team custom-made the metal lighting fixtures over the dining table to work as eye-catching art without obstructing the outdoor views. 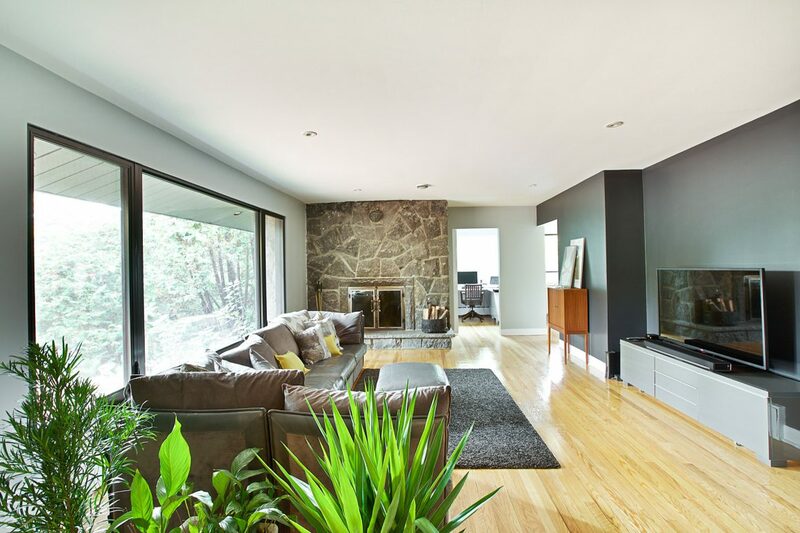 A gas fireplace adds coziness to the living area. 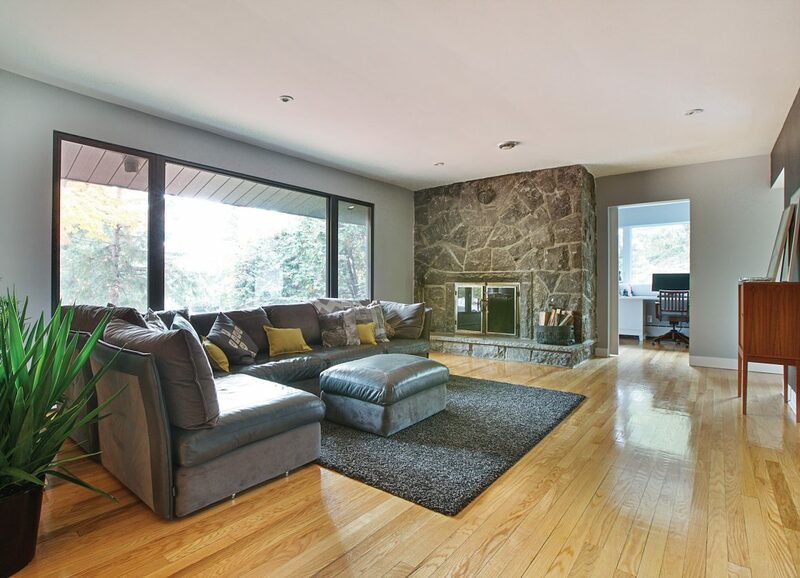 Hints of the home’s 1960s origins are evident in the stone fireplace. 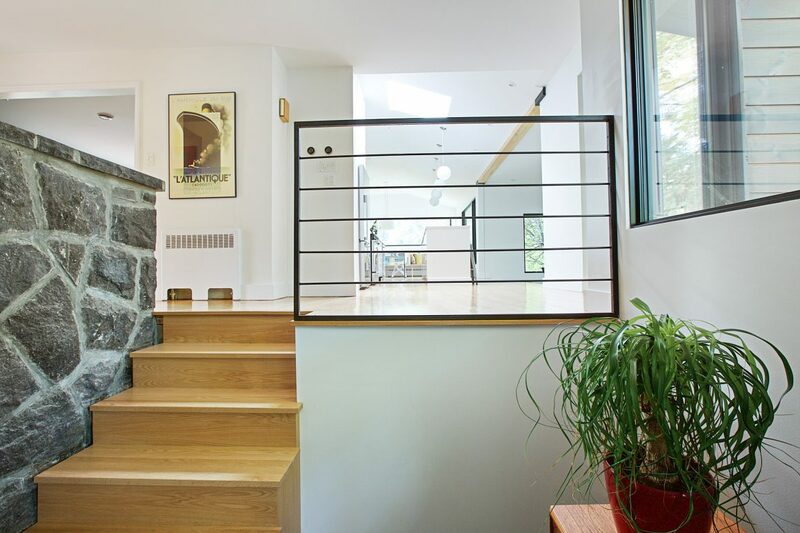 The homeowners kept the original masonry indoors to preserve some of the past. 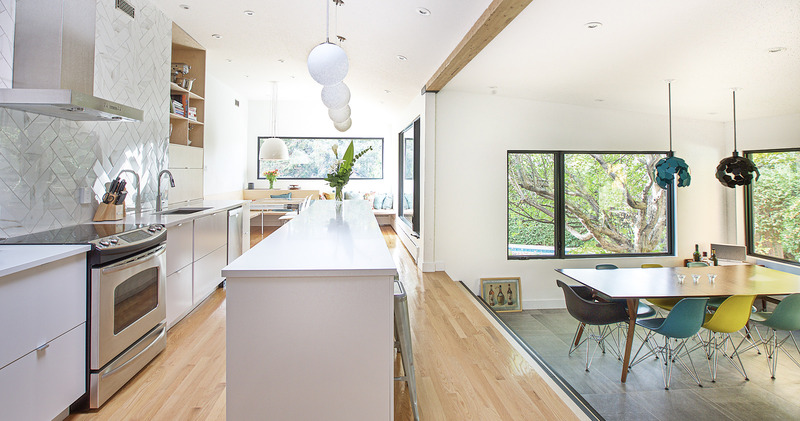 Stéphanie adores the 13-foot-long kitchen island that provides ample space for her to prepare meals while her children sit at the counter doing homework or the family’s guests relax and chat over beverages. 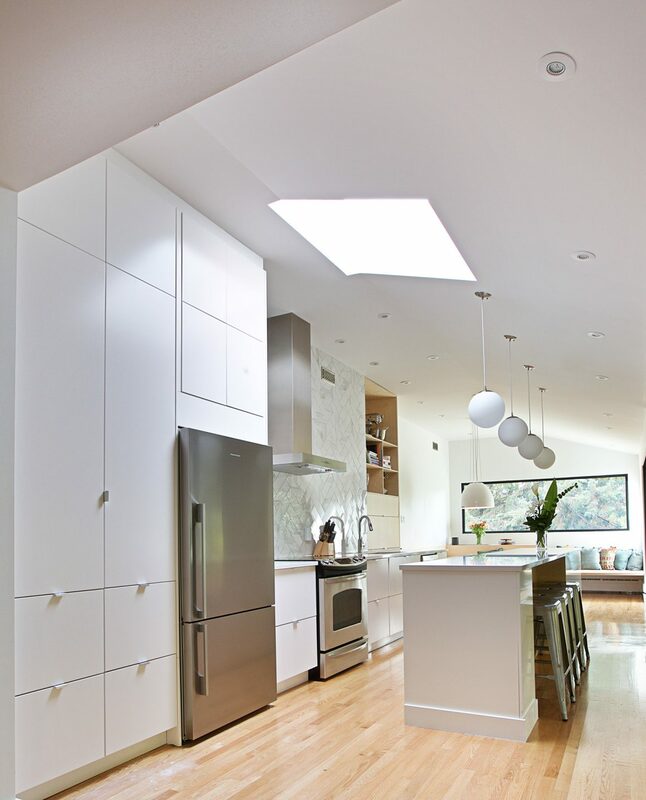 An existing kitchen skylight was reincorporated into the design to maximize natural light in the central space. Discreet recessed lighting provides lustre to the white-lacquered cabinetry while pendulum globes light up the key work area. A classic marble tile boasts a chevron pattern on the backsplash. The dinette’s banquette takes up the entire walls in the space that was opened off the far side of the kitchen. “We extended it the whole length so there’s room to have cozy cushions and stretch out to relax or read under all of the natural light,” Lamothe says. 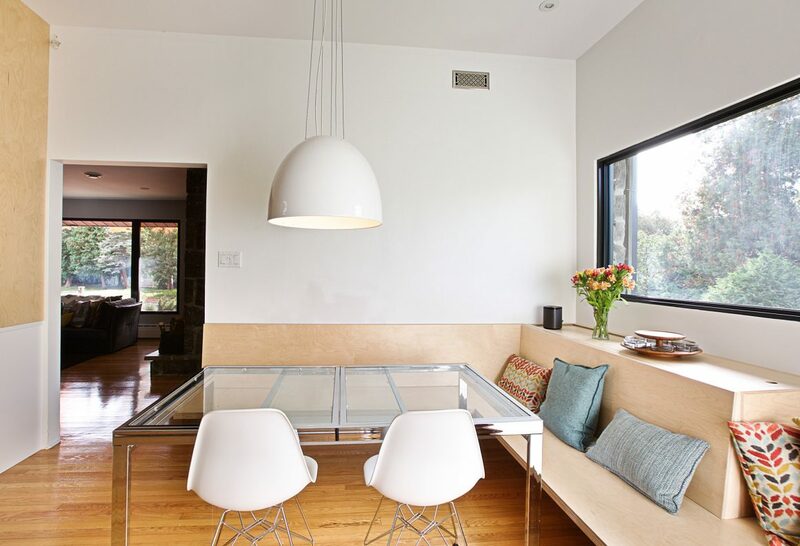 From the kitchen, the elongated window over the banquette is like a picture frame. “I feel like I’m always looking at these wonderful nature canvasses,” Stéphanie says. 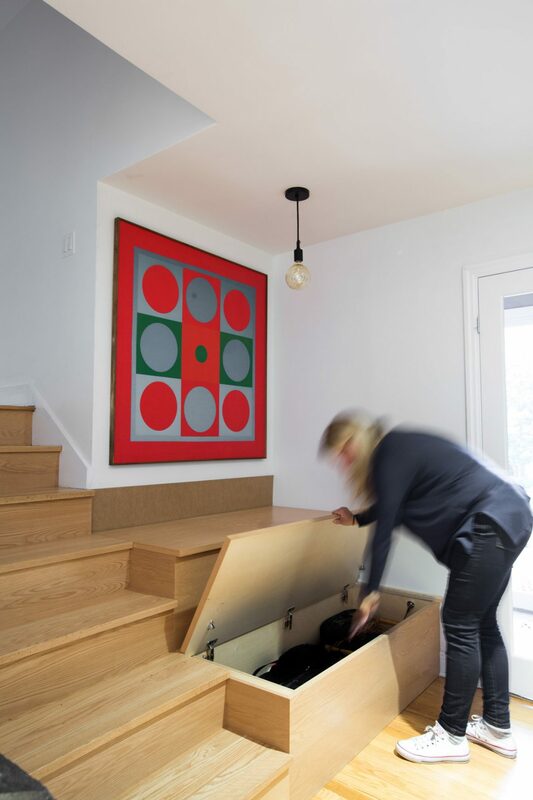 The new stairs and discreet storage bins were made to complement the oak flooring, which was refinished to restore its original light grain and lustre. 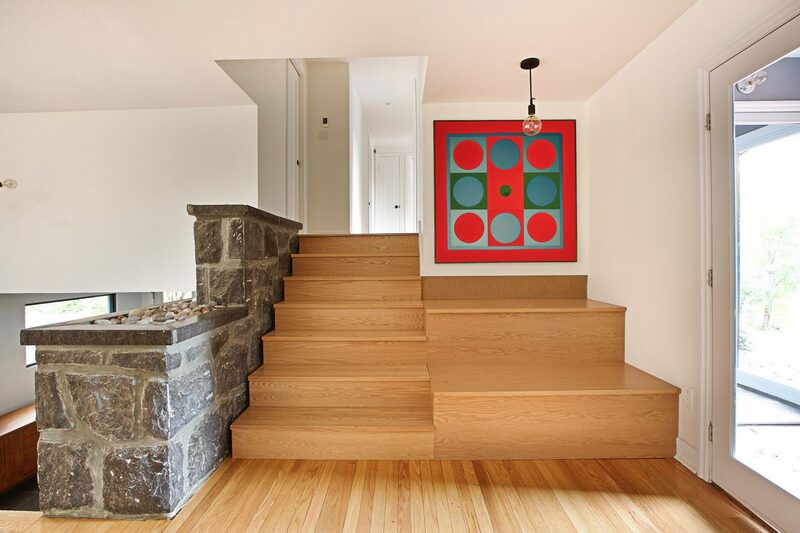 The accent wall has been reincarnated with new stairs, along with two unobtrusive storage chests that were custom-built in the same light oak to give the family’s youngsters a place to dump their backpacks when they arrive home from school through a side door.